In this article, you’ll discover where digital advertising dollars are being spent, why marketers are flocking to certain media, and how you can keep up with the pack. Discover new research regarding the spend of social media advertising dollars. 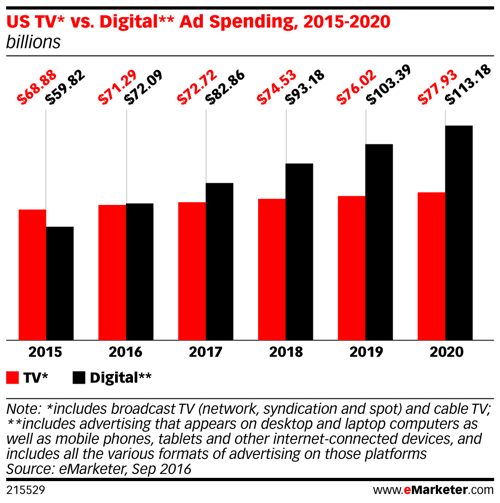 A recent study released by eMarketer shows digital ad spending in 2016 surpassed that of TV, a result that went against the predictions they released in March. Their initial estimate was that TV would remain on top until 2017, when digital would edge it out. The figures in this recent report, however, show 2016 TV ad spending will be $71.29 billion with digital coming in at $72.09 billion. Digital accounts for 36.8% of total media ad spending and TV is just a few tenths of a percent lower at 36.4%. The difference between TV and digital spend will continue to grow. It’s no surprise that digital ad spending has grown so much, given the sharp rise in social, mobile, and video. As a whole, social ad spend comes in at $15.36 billion or 21.3% of the total digital ad spend, up from 18.2% last year. But this is the year of mobile, as ad spending on mobile is expected to rise 45% to nearly $46 billion. In fact, in its latest quarterly report, social media juggernaut Facebook announced that 84% ($5.24 billion) of their advertising revenue for Q2 2016 was from mobile ads. It only stands to reason because of the 267 million Internet users in the U.S., nearly 79% of them access the Internet and social networks regularly via a mobile device. That number is expected to rise to 86% by 2020. 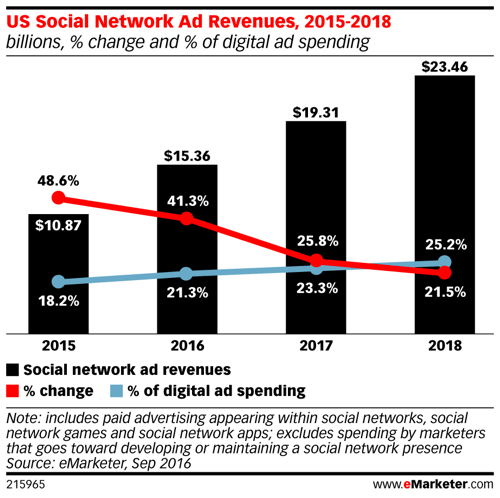 Slow growth is projected for social network ad spending. If you have to choose only one direction on which to concentrate your advertising dollars over the next year, mobile is the way to go. Internet analyst Mary Meeker (who famously predicted the meteoric rise of Facebook in 2010) delivered her 16th annual State of the Internet presentation in early September, in which she predicted that mobile advertising was a $22 billion opportunity for marketers. She based this prediction on a comparison between time spent on media and the amount spent on advertising in each category. 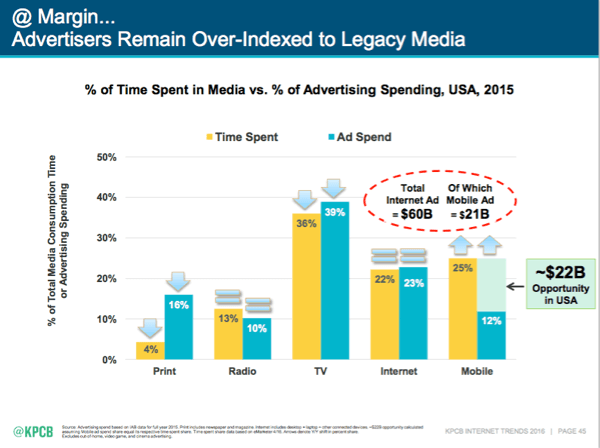 Mary Meeker predicts a huge advertising opportunity in mobile. If you want to follow Mary’s (and our) advice, here’s an article where we give you tips on how to optimize your mobile ads. eMarketer’s research shows display ads’ $34.56 billion spend accounts for 48% of the total digital ad spending. The display ads category was broken down into formats that include banners/other (which include Facebook’s news feed ads and Twitter’s promoted tweets), video, rich media, and sponsorships. Again, advertising on social media platforms is at the head of the pack when it comes to where advertisers spend their dollars. 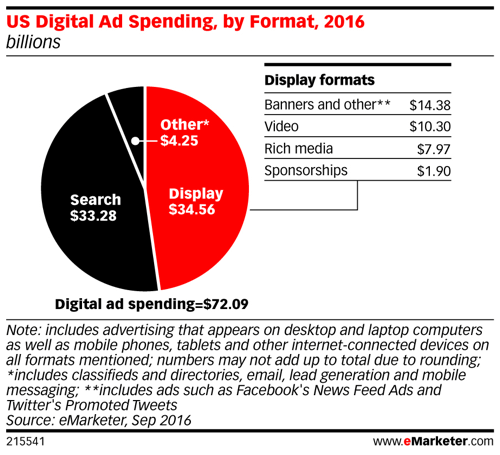 Search and display ad spend is very close, but display takes the lead. While you shouldn’t kick it to the curb just yet, it looks like putting time and resources into anything in the “other” category won’t serve you nearly as well as any advertising on the Internet. Our latest report shows that a company can see results from their social media efforts in as little as 6 hours per week. Keep in mind, however, that the significance of your results directly correlates to how much time you dedicate to it. Search ad spend shouldn’t be discounted, either. It’s clearly still a strong performer, with Google continuing to do what Google does best (outside of their actual search function): provide marketers with the ability to highly target a massive worldwide audience. Search is only about 1.25% behind digital ad spend, so it isn’t going anywhere anytime soon. It’s true that the number of people using social networking continues to grow, but Internet searches will never cease. In our 2016 Social Media Marketing Industry report, we found that 55% of marketers currently use Facebook as their main platform and 67% of respondents plan to increase their marketing activities on Facebook. An overwhelming 86% of social marketers regularly use Facebook ads, while only 18% use Twitter ads. These numbers coincide with what social media advertising spend reports are showing because Facebook alone accounted for $11.93 billion or 16.6% of all digital ad spend compared with Google’s $4.79 billion share or 13.8%. An article from March on Social Media Examiner stated Facebook has a 66% effectiveness rating for B2C social media platforms, based on data from the Content Marketing Institute. Twitter came in third place (behind YouTube) with a 30% effectiveness rating. This is definitely reflected in the total ad spend seen for Twitter. For 2016, Twitter made up only 8.7%, down from 11.8% last year. eMarketer predicts the numbers for Twitter will continue to drop, though not as sharply as they did in the last year. With the introduction of First View video ads (which places a promoted video near the top of a user’s feed) in February 2016, it’ll be interesting to see how (or if) these figures change. 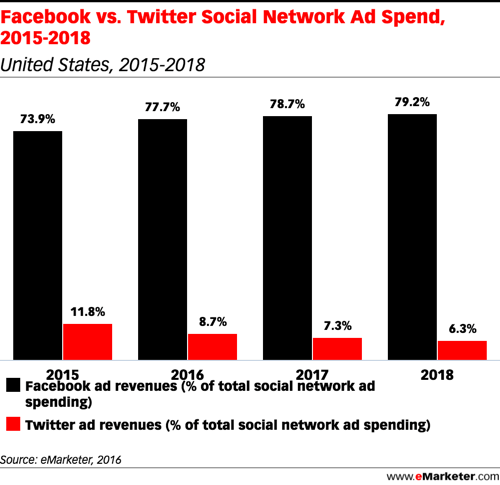 Facebook ad spend blows Twitter out of the water. Facebook is the obvious choice when deciding where to put your social media marketing ad dollars, simply due to the sheer number of people utilizing it. After all, if they continue to use it and more marketers keep flocking to it, there’s obviously a method to their madness, which is most likely results. But don’t discount Twitter marketing yet. Periscope, which is owned by Twitter, states that by the end of March 2016 (the latest data available), there were more than 200 million broadcasts on their platform. That translates into 110 years’ worth of video. While they’re still figuring out ways to monetize the platform, it potentially presents a lot of opportunities for marketers. If you’re looking to get ahead of the pack and try something new, keep an eye out for this development. According to eMarketer, nearly 66% of marketers plan to use Facebook for their video social marketing, while just over 42% plan on using YouTube. Our 2016 Social Media Marketing Industry Report shows that 73% of marketers plan on increasing their use of video in general and 50% plan on utilizing live video services such as Facebook Live and Periscope in the next year. The other half wants to learn more about live video. 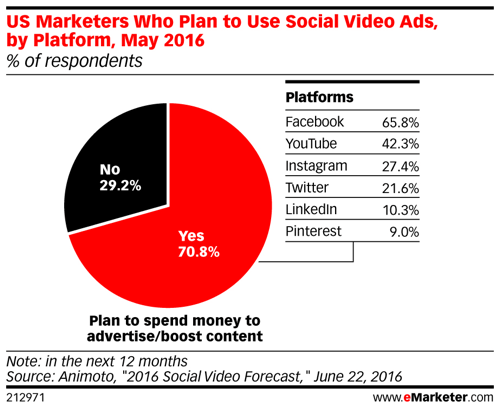 Facebook is the first choice for social media marketers for video ads. eMarketer’s “US Digital Ad Spending, by format” graphic shown in subhead #2 has video coming in second place with $10.3 million in ad spend, which is 14% of the total amount spent by marketers. An interesting thing to note is that YouTube is a platform made up of only videos, so for marketers to choose Facebook over YouTube for their social video ad money is telling. One possible reason is that since YouTube is strictly videos, there is a lot of competition for viewers’ attention, while Facebook currently provides other content as well. If you’re just starting out with social video ads, look to Facebook first because it has the largest user base, a wide range of video ad options, and a robust set of audience targeting features. As Zuckerberg stated, video on Facebook is going to be even more front and center in the near future. Marketers using video advertising on social platforms benefit from the shareability. When served to a highly targeted audience, video ads tend to blend in better with the content the viewer is already engaged with, making users more likely to hit the share button. If you select an ad format that autoplays silently, be sure the visual content is more interesting and stimulating. Your ad is competing for viewers’ attention and you have to compensate for losing the attention-grabbing factor of sound. On the other hand, consumers tend to get annoyed by ads autoplaying with sound, so your view-through rate (VTR) may suffer if you go that route. While they didn’t make this list, live-streaming social platforms such as Periscope and Facebook Live are currently testing ways to monetize content, so they may become a viable option in the very near future. Thank you to Michelle Krasniak for her research on this topic!